lightblack specialise in designing innovative Macromedia Flash authored web sites. Design led, and with a focus on quality and usability, we ensure that we communicate the right message about your company or project. Flash technology allows the design to move away from a static HTML format and integrate all the elements of the site around a custom interface. Flash websites can incorporate advanced media handling functionality, including video and music optimised for web viewing. Specialising in Flash allows us to offer sites without the excess price penalites put on Flash by other companies not specialists in offering fully flash bespoke solutions. Fully authored in Flash this site maximises the potential of the medium to present a rich stock of photographic images in an innovative and captivating way. This site was awarded a NetDiver Design forte Award and a Plasticpilot award. Wendy McMurdo is a photographic artist based in Edinburgh Scotland. The site is a showcase of her work and uses innovative flash image scaling techniques. Bis is London based Fine Art Gallery with a unique approach offering high quality reproductions alongside original works from established Artists. 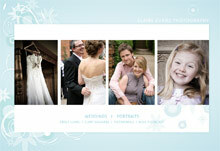 Wedding and Portrait Photographer based near Birmingham, Staffordshire. Full Flash Website. Portfolio website for a Scottish Photographer.